Bob is seeking a business line of credit for his contracting business. Bank A offers him a $100,000 line at Prime plus 1%. Bank B offers him the same line limit at Prime plus 3%. Which bank offer is better? Answer: It depends on the Total Cost of Capital. As the saying goes, if a deal sounds too good to be true it often is. 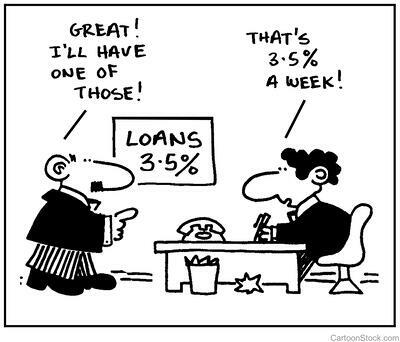 Low interest rate offers often come with other strings attached allowing the lender to make their profit somewhere else. Business lines of credit are another area where Total Cost of Capital deserves increased scrutiny. The quoted interest rate is often based solely on the rate you pay when you actually utilize the line of credit. So if you draw $50,000 from your available line in the sample above, Bank A will charge you prime plus 1% and Bank B will charge you prime plus 3%. What's important to take into account is what else is happening at the bank. Most banks require you to move your deposit accounts over to them to qualify for a line of credit. What fees are involved in your deposit accounts? Are you charged for monthly use, for wire transfers or other conveniences? Those little costs can add up quickly. There are also often fees for money that the bank has made available to you but that you have not utilized. This is often referred to as the 'commitment fee' or sometimes the 'non-usage fee.' Some lenders will "wow" a business with an offer of a large line of credit at a low rate. Their expectation is to make it up with the commitment fee. Lines of credits are typically subject to a 'Renewal Fee' when the bank reviews the line of credit for possible extension beyond the first year. Sometimes when you borrow funds the lender will require a regular review - usually quarterly - of your corporate financials. For smaller loans these financial reports can typically be internally prepared, but as your business needs grow and you find yourself needing larger lines, be mindful of what the lender requires in your financial reporting. Some lenders will require you to submit financial statements that have been reviewed or compiled by a CPA. In some cases your lender may require periodic submission of Audited Financials, which are significantly more expensive to produce. Beyond the items listed above, there can be other costs involved with obtaining a bank line of credit. The best way to compare is to try to get as close to an apples-to-apples review as you can. Take the time to get more than one offer and thoroughly review all the terms and conditions. Banks will typically give you a non-binding "term sheet" spelling out what they can offer (think of it as a 'pre-approval'). Term sheets are a great place to start as they will spell out most of the fees associated with the line of credit. But it will not factor in the bank's other fees (like on your deposit account) or the costs you might incur outside the bank to stay compliant with their covenants (like hiring an audit firm). When you own a business, every dollar matters and so does your time. If you need help finding the right banking solution our Banking RFP Service might be a good option for you. Give us a call to learn more. Need Help Finding Right Bank Line of Credit?